I will not be allowed to vote in this election. My registration has been stricken from the rolls. I can prove it. I know how it was done, who did it and I have a paper trail. I'm not alone. 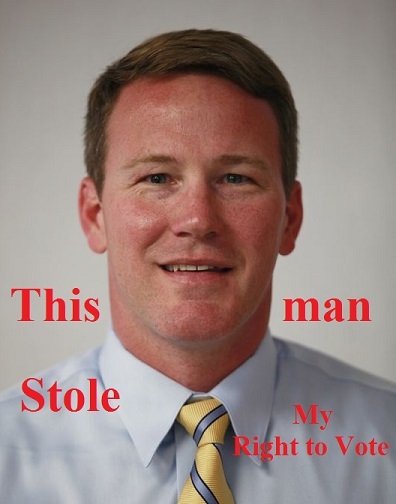 I can prove, with paper trail, that at least one other person was illegally stricken from the Ohio voter rolls. In all, 1.2 million people were purged in Ohio. An unknown but large number of them, like the two us us were purged illegally. Donald Trump is claiming that the election is rigged, though I doubt he has the intellectual capacity to understand how. Direct paper evidence in multiple states proves that BOTH parties are illegally interfering with the election by directly preventing Americans from voting. Since I personally caught the Democratic National Committee engaging in voter suppression in Rhodes Island, I'll maintain bi-partisan balance and expose the Republicans in Ohio. My right to was taken from me in the following manner. I lived at the same address for two and a half years. I registered to vote there twice, once when I moved there and once when I renewed my driver's license. I moved from there to where I live now in February of 2015 and changed my address on my driver's license. I renewed my driver's license again in November of 2015. An absentee ballot arrived at my former address for me. It showed up on October 9th 2016. It was labeled “DO NOT FORWARD.” October 11th is the deadline for registering to vote in the this federal election. I have been removed from the rolls. I can not vote. I'm basically no longer a citizen. On October 13th I checked my mailbox. There was an absentee ballot in it for the former resident of this place who moved out at the end of January 2015. I never met him, but based on mail that came for him he is a young, politically involved Black Minister. He now lives out of state. He does not seem to be the kind of guy who falls behind on his paperwork. His ballot was labeled “DO NOT FORWARD.” He can not vote in Ohio now. He was mailed an absentee ballot AFTER the voter registration deadline had passed, and thus stricken from the rolls. He has a driver's license in another state, and thus his driver's license, and voter registration information, should have been updated in February 2015. The letter never should have been mailed. One person detecting this pattern will normally be dismissed by mainstream media as a computer “error” or “glitch.” This reporter does not buy that for one instant. Computers do have “glitches.” A computer is a finite state automaton with a stack. They do exactly what they are told. Computer programers, which this reporter is, make “errors” in the instructions that they give to the computers. Deus ex machina is not a factor in this, homo ex machina is. That man, or those men and women, in this machine have names. I know those names. Triad GSI is headquartered in a quiet residential neighborhood in the home of Todd A Rapp and his four adult children. Todd founded Triad, his children run it, and they sold the family home at 358 S Monroe to their own company for tax purposes. The Rapp family has been in the election business for years, famously designing the confusing butterfly ballots that caused the famed hanging chads in the 2000 Gore v. Bush Election in Florida. They were also caught, by this reporter and Bob Fitrakis of the Columbus Free Press, designing errors into the voter registration look up system in 2012. The family are known Republican partisans with a self-expressed keen interest in the makeup of the US Supreme Court on reproductive rights grounds. Should I bother to hold my nose for a major party candidate and pretend to vote, vote would be “provisional.” Provisional ballots are counted second, after the election, if niether candidate concedes and each is subject to challenge. In other words, because of a partisan set of programing instructions by a small family of religious extremists in rural Ohio, I along with the former resident of my apartment and 1.2 million other residents of the state of Ohio are no longer full citizens and may not vote. That is a rigged election and I do not hear Donald Trumpeting a word about it.